An honour roll was placed in the church as a memorial to theose who served in World War One. The honour roll is handsomely carved in Tasmanian blackwood having three panels. 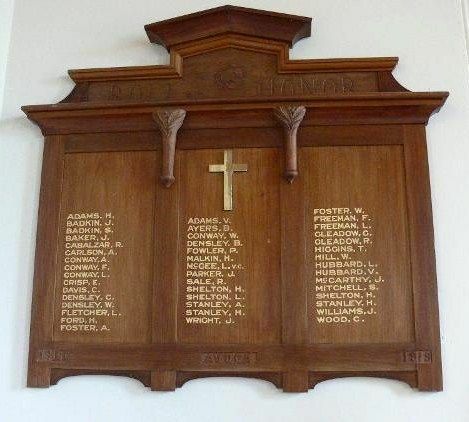 The names of the dead are placed in the centre panel under a brass cross. On either side are the names of the returned men. The Honour Roll was consecrated and dedicated on the 2nd November 1919 and unveiled by Mrs C. Shelton. When the flag fell, great sorrow was felt for the mother standing there who had lost two of her sons in battle while the third son had returned home a cripple. Examiner (Launceston), 7th November 1919.